Take a step back into the old west as you enter Coyote Gulch. In this part of camp, you will find twelve western themed cabins which each able to accommodate twelve people. Cabins have electricity and are heated in the winter time. Food service is included and indoor meeting facilities are available for guests staying in cabins. Join the Wagon Trail! 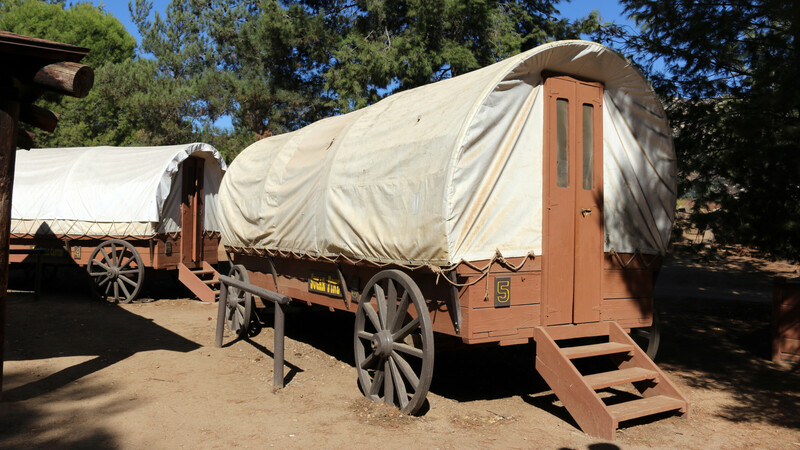 Each of the eight authentic Conestoga-style covered wagons sleep up to twelve people. There is electricity and water available in this area. There are also picnic tables, a central campfire circle, an outdoor grill with food prep area, and an outdoor meeting area available. Exclusive use of the Wagons requires a group of forty or more. Enjoy a stay in the Spirit Runner Tepee Village. Each of our eight tepees can sleep up to twelve people and area has water, electricity, and a picnic table. Our Tepee Village Amphitheater is available for campfires with outdoor grill and food prep area nearby. Exclusive use for the village requires a group of forty or more. Travel back in time to the mining days and visit Boom Town. Each of the six Miner Shacks sleep up to twelve and have electricity and an outdoor meeting area is available. If you prefer sleeping under the stars or nestling up in an RV trailer, our Family Grove area makes an ideal camp setting! Each site has water, electricity, a fire ring and picnic table. For larger groups, outdoor meeting areas are available.